For sale is a Monster brand PlayStation 2 (PS2 & PS3 compatible) Gamelink 400 component video cable. Please note this cable does not have audio plugs. You must use the optical audio port when using this cable. Item has been cleaned and tested. Works great and ships free. 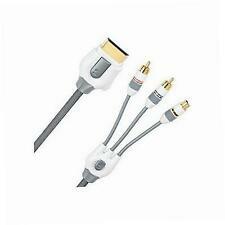 All in one digital AV cable for easy Xbox 360 hookup to HDTV or receiver. 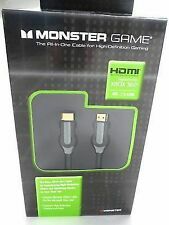 Monster Cable Monster Game Gamelink 300 S-Video AV Cable for PlayStation 2 *NEW*. Shipped with USPS Priority Mail. You will need to use the fiber optic port for audio. This cable will provide the best picture quality available. Used, working. View pictures, good condition. This is an optical adapter for a monster cable component cable for the original xbox. Monster Cable Original Xbox Green HD Component Cable Tested. Condition is Used. Shipped with USPS First Class Package. Exclusive Monster technologies make it possible for you to enjoy sharp, detailed video and superior stereo sound with this superior quality component video and stereo RCA connection. This item does not work with the Xbox 360 E.
Cable has never been used. Cable Length: 6ft - FAST FREE SHIPPING! PlayStation 2 blue Monster S-Video cable. Dual Head 2-player design in one cable. NON CONTINENTAL USA AK / HI / PR / APO / FPO / & OTHER US TERRITORIES. Heavy duty durable and flexible cable jacket. This Monster Cable Playstation 3 HDMI Cable is capable of delivering the Blue Ray and PS3 experience at a high definition resolution as high as 1080p with 7.1 surround sound. This replaces the standard cables that come with your system with a convenient single cable solution to your high definition needs. This cable features large gauge copper conductors that boost the bandwidth for a more realistic and lifelike image, heavy duty shielding to reject RF and EM interference. Monster Game HDMI delivers high definition video and eight channels of Dolby Digital and DTS surround sound through a single cable to get the most out of your PS3 and home entertainment system. Monster Gamee High Performance, Low Noise Audio/S-Video Cable 10 ft long For PlayStation 2. Cables were used years ago, but have been in storage since. They are in great shape and work great. Will be shipped with great care. This is a Monster Wii Component Cable! The cord is clean and tested and in good condition. 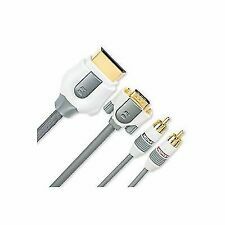 NEW Monster AV AUDIO VIDEO Composite RCA Cable for made for Sony Playstation 2. The Monster Cable Playstation 3 HDMI Cable is capable of delivering the Blue Ray and PS3 experience at a high definition resolution as high as 1080p with 7.1 surround sound. This replaces the standard cables that come with your system with a convenient single cable solution to your high definition needs. This cable features large gauge copper conductors that boost the bandwidth for a more realistic and lifelike image, heavy duty shielding to reject RF and EM interference. 10 FEET LONG. HIGH PERFORMANCE, LOW NOISE AUDIO. USED BUT IN EXCELLENT CONDITION! I will deal fairly with you in an honest and polite manner. Monster AV Cable for Xbox. Cable has 1 Video Rca connection and 2 Audio RCA connection. 3 AVAILABLE. I HAVE OTHER AUDIOPHILE CABLES LISTED. You will get the item in the pictures. Ne w in the bo x! Model: FCG778. Type: AV Cable. Cable Length: 8ft. Signs of wear can include aesthetic issues such as scratches, and discoloration. Condition: Used: Very Good. Condition: Used Very Good. Color: Black. Exclusive Monster technologies make it possible for you to enjoy sharp, detailed video and superior stereo sound. For Hookup of Flat Screen Moniters and Other Displays with High Performance VGA Video Input. Item Type: Xbox 360. Platform: Microsoft Xbox 360. In excellent condition works perfectly. 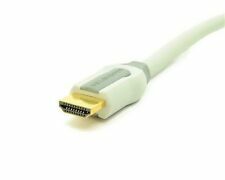 Rare and Discontinued Monster PS1 PS2 PS3 PlayStation S-Video Cable Cord S Video High Quality. Condition is Used. Shipped with USPS Parcel Select Ground. Monster Cable Game Link PG L 400 CVAA Game Console Cable Video Audio 10 ft. Item Type: PlayStation 3. Platform: Sony PlayStation 3. AV Connection: Optical. Type: Audio Cable. Cable Length: 10ft. Color: Black. They maybe marked, or have identifying markings on it, or show other signs of previous use. Used but still in excellent condition. This is for the Official Monster Premium S Video AV Cable for the Original Xbox shown in the pictures. Has been cleaned and tested, works perfectly. This is for the Original XBOX.